We're not sure this is his color. Tragic news coming out of Charlottesville this morning. The fox that captured the region's imagination after stealing someone's sweater was trapped on Wednesday and killed for rabies testing, reports the Culpeper Star-Exponent. Oh, we guess we should mention that Sweater Fox also bit two people, which probably isn't OK. The local SPCA put down the fox at the request of the health department, which had decided to test the fox for rabies. Unfortunately, that involves examining the animal's brain, which is generally bad news for the animal involved. The two people who were bitten are currently on a course of rabies vaccines. Somehow though, despite his sassy attitude, Sweater Fox was still beloved by many. 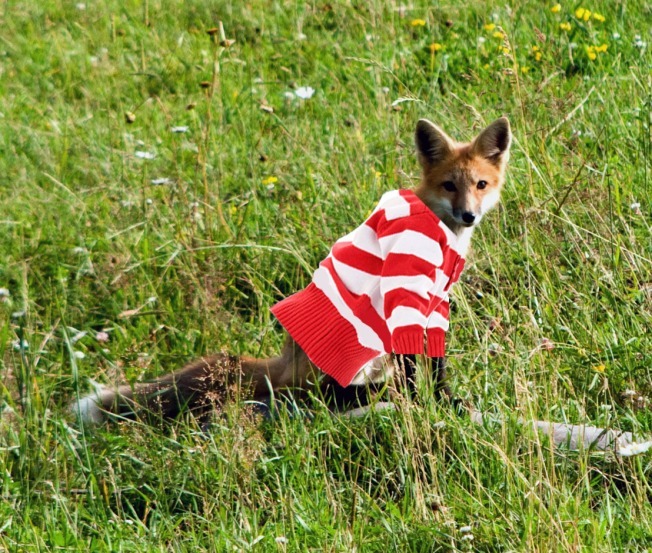 In addition to biting two people, the fox also reportedly stole a sweater. By Thursday, Internet apparel retailer zazzle.com was selling T-shirts with the words "I survived" below an image of a fox wearing a sweater in UVa’s orange and blue. Isn't it ironic? The shirts say "I survived" -- but Sweater Fox didn't.